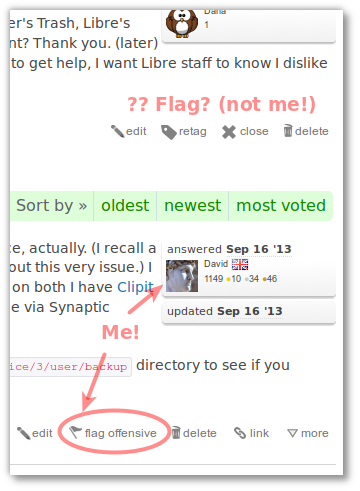 I'm active on the Ask.LibreOffice.org site, which at present is using Askbot version 0.7.48. What is needed, of course, is the possibility of flagging offensive content from other contributors -- and, in fact, I'm quite sure this functionality worked as expected previously. I don't think it's "just me" (others at ask.libo have noticed this too). Is there a fix? I hope so! This is fixed in 0.7.49 release, will propagate to your site eventually. That's good to know - thanks for the reassurance! Spam - How to block special emails?